Somehow, a set of deeply conservative assumptions about children — what they’re like and how they should be raised — have congealed into the conventional wisdom in our society. Parents are accused of being both permissive and overprotective, unwilling to set limits and afraid to let their kids fail. Young people, meanwhile, are routinely described as entitled and narcissistic. . . among other unflattering adjectives. 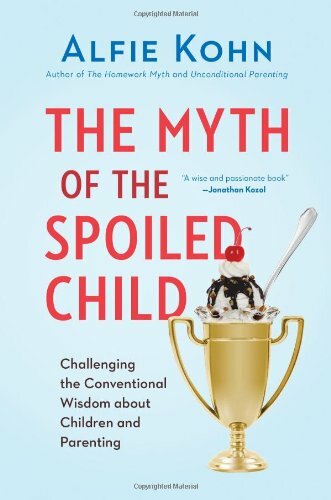 In The Myth of the Spoiled Child, Alfie Kohn systematically debunks these beliefs — not only challenging erroneous factual claims but also exposing the troubling ideology that underlies them. Complaints about pushover parents and coddled kids are hardly new, he shows, and there is no evidence that either phenomenon is especially widespread today — let alone more common than in previous generations. Moreover, new research reveals that helicopter parenting is quite rare and, surprisingly, may do more good than harm when it does occur. The major threat to healthy child development, Kohn argues, is posed by parenting that is too controlling rather than too indulgent. With the same lively, contrarian style that marked his influential books about rewards, competition, and education, Kohn relies on a vast collection of social science data, as well as on logic and humor, to challenge assertions that appear with numbing regularity in the popular press. These include claims that young people suffer from inflated self-esteem; that they receive trophies, praise, and A’s too easily; and that they would benefit from more self-discipline and “grit.” These conservative beliefs are often accepted without question, even by people who are politically liberal. Kohn’s invitation to reexamine our assumptions is particularly timely, then; his book has the potential to change our culture’s conversation about kids and the people who raise them.